Jean-Luc Nancy stands as one of the great French theorists of "deconstruction." His writings on philosophy, politics, aesthetics, and religion have significantly contributed to the development of contemporary French thought and helped shape and transform the field of continental philosophy. Through Nancy's immense oeuvre, which covers a wide range of topics such as community, freedom, existence, sense/ touch, democracy, Christianity, the visual arts and music, and writing itself, we have learned to take stock of the world in a more nuanced fashion. In this collection, contemporaries of Nancy and eminent scholars of continental philosophy, including Giorgio Agamben, Étienne Balibar, Ginette Michaud, Georges Van Den Abbeele, Gregg Lambert and Ian James, have been invited to reflect on the force of Nancy's "deconstruction" and how it has affected, or will affect, the ways we approach many of the most pertinent topics in contemporary philosophy. The collection also includes Jean-Luc Nancy's previously unpublished 'Dialogue Beneath the Ribs', where he reflects, twenty years after, on his heart transplant. Nancy Now will be of critical interest not only to scholars working on or with Nancy's philosophy, but also to those interested in the development and future of French thought. Verena Conley is visiting professor of literature at Harvard University. Irving Goh is a visiting scholar at the Society for the Humanities, Cornell University. Drawing from some of the most prominent voices in contemporary continental philosophy, Nancy Now addresses an impressive range of Nancys texts and motifs. The essays included here demonstrate in new and demanding ways the continued timeliness the untimely contemporaneity of Nancys thinking. This cutting-edge collection proves that Nancy is the thinker of our time. Nancys understanding of the present disrupts every claim of equivalence underlying the worlds political economy. Nancy Now is the constellation born from this liberating breakthrough. 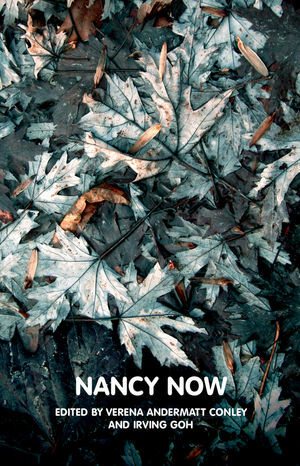 "Nancy Now is a collection that (re)introduces one of the most prominent figures in contemporary continential philosophy while emphasising the diachronicity of his work."